During this stage, all the baby’s major body systems are in place and will continue to mature. Their skeletal system will begin to strengthen, placing a greater demand for calcium. 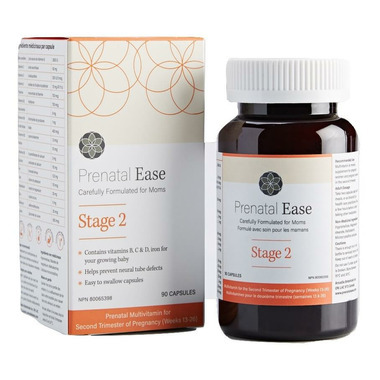 Prenatal Ease Stage 2 provides significantly more calcium and vitamin D than Stage 1 to support this demand. Maternal discomforts like morning sickness and fatigue also start to settle down. As the baby matures, there is an increase in blood volume and blood flow to the womb to nourish the baby. Prenatal Ease Stage 2 provides just the right balance of iron to support increased blood production, but not enough to cause side effects like constipation. Stage 2 contains powerful antioxidants such as vitamin A, E, and C, carefully balanced for the second trimester. These antioxidants help neutralize free radicals and are also critical for the formation of many different systems. In addition, 100% of vitamin A in Prenatal Ease Stage 2 comes from beta-carotene. One of the benefits of taking beta-carotene instead of vitamin A is the difficulty of overdosing, because your body will only create vitamin A from beta-carotene if you need it. Beta-carotene has all the benefits of vitamin A, but without the risk of overdosing. Directions: Take 2 capsules daily with meals, or as directed by a healthcare practitioner. Take a few hours before or after taking other medications. This multivitamin can be taken throughout pregnancy, but is optimized for women in their second trimester. Do not use if under cap seal is broken. Store at room temperature. As with any dietary or herbal supplement, you should consult healthcare practitioner prior to using this product if you are taking medication or have a medical condition. Keep out of reach of children. There is enough iron in this bottle to seriously harm a child.